Hey there SAMQG folks! Just wanted to hop on and let you know we have a NEW meeting location for August 2014. Please stop by and check out the group. Members, make note of the change. We will no longer be at the church off 281. NEW MEETING LOCATION & TIME!! We're moving locations and starting earlier! Meeting starting at 6:00pm and ending at 8:00pm. Sewcial Hour: Salsalito Restaurant at Bandera and 1604, immediately after the meeting. Please do not bring food to the library. I think everyone wanted to win the blocks below. It was such a simple design, we had members making 10-15 just in hopes of winning the pile. 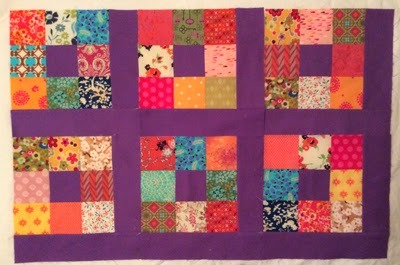 And for the purple 9-patch, the winner finished up the quilt by adding in her own additional blocks, quilting it and finishing it by the next month. WOWSA. Some guilds also call this "Lotto Blocks". Our group runs the Block of the Month by showing the next month's BOM block at the meeting. The block of the month chair/designers posts the pattern in a pdf document on our Facebook page and then we offer a pattern in the newsletter, which goes out about a week before the meeting. Members can make as many blocks as they want. For each block made, the member is entered in the drawing. We take all the actual blocks, drop them in a bag and pull out a single winner. Members generally recognize the fabrics they used, so there's no need to pin your name to the block. You may have noticed some recent changes to our Guild Facebook Page. The Board is making these changes for the betterment of our group and the protection of our dedicated paid members. We recently changed to a "Closed" group privacy wise, which means people can still find our group and request to be added (and will be added if they are a paid member), but only members of the group will be able to see things we post like photos, events, and comments. We have also removed all non-paid members as of tonight. We sent PMs to members who were once active, but have fallen off this year to let them know they can renew and be added back to the group. If you are interested in becoming a paid member please contact our Membership Vice President. We also sent messages to those unpaid members of the page who own businesses to let them know what we are doing and that we will be distributing a new advertising policy in the next few weeks. The Board has decided that the FB page will be an advertisement free zone. This is based on numerous members feedback and not simply a Board decision. If you post an ad, you will be warned and then if the behavior continues, you will be removed from FB, paid member or not. Ads will be allowed on the Blog and in the Newsletter for a fee, but that policy will be distributed to paid and unpaid businesses in the next few weeks. Also, we would like to remind all paid members, that FB and SAMQG is a positive place for our community and negative/disrespectful comments will not be tolerated. If you make such comments, you will be warned and eventually removed if the behavior continues. This blog will be our public face. Please subscribe, stop by, see what we're making, leave comments, ask questions. 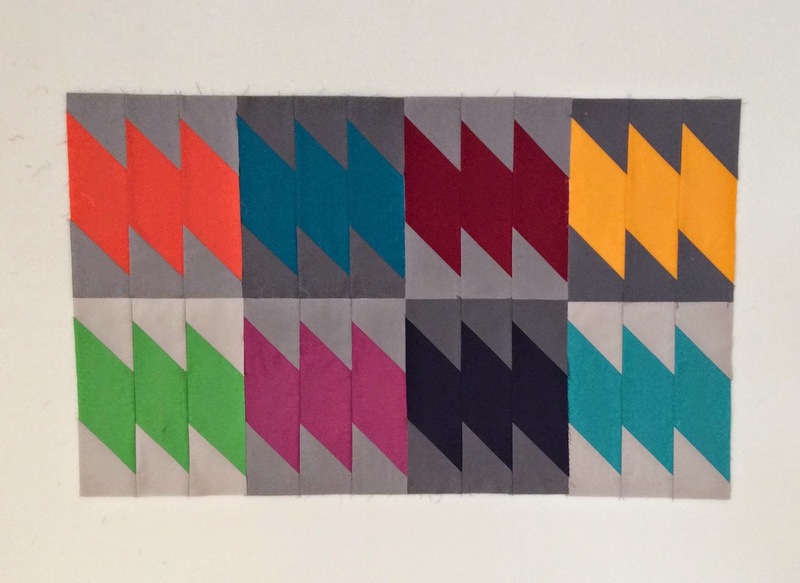 We're glad you are here and we're glad you are taking an interest in SAMQG's Modern Quilting.